Lazer Cut Seder Plate Round. This artistic Passover Seder Plate is part of the Lily Art design collection. This unique stainless steel Seder Plate combines a more modern style to a traditional item. The Seder plate is raised by small legs each etched with a pomegranate. 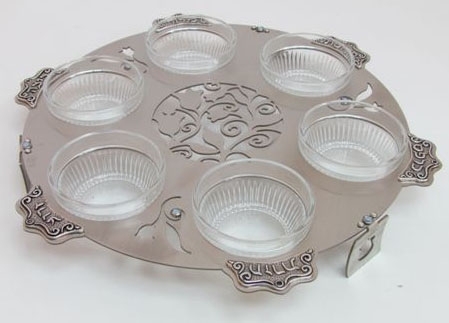 The Seder Plate has six round cut holes where the included small glass bowls are placed. The Seder Plate is designed with pomegranates and flowers precisely cut using laser cutting technology. Silver colored plaques with the Hebrew names of the symbolic foods that are placed on the Seder Plate are affixed outside of the base serving as identifying labels. The glass bowls are separate from the Seder Plate making it easy to clean and care for. The six Hebrew plaques have the names of the traditional foods – “Zeroah” (shankbone), “Beitzah” (hard-boiled egg), “Maror” (bitter herbs), “Haroset” (sweet brown mixture), “Karpat” (dipping vegetable) and “chazeret” (romaine lettuce).